A small wooden box awaits visitors at the gate of the Grand Mosque, also known as Sultan Hassanal Bolkiah Grand Masjid in Cotabato City. Secured with a padlock, it’s messily scribbled with “donation box” on the front. Another one stays on the corridor just before visitors could roam every corner of the second largest mosque in Southeast Asia. Mohammad Amoran Saranggani, one of the maintenance supervisors for the Grand Mosque, says these boxes could collect around P3,000 on a good day with more than 150 visitors. This is enough to cover a month’s water and electricity bills, as well as temporary fixes for the mosque’s damages. Together with another maintenance supervisor, Saranggani has been a volunteer at the mosque for seven years. The two of them man the five-hectare compound where the 5,000-sq. m. mosque sits. 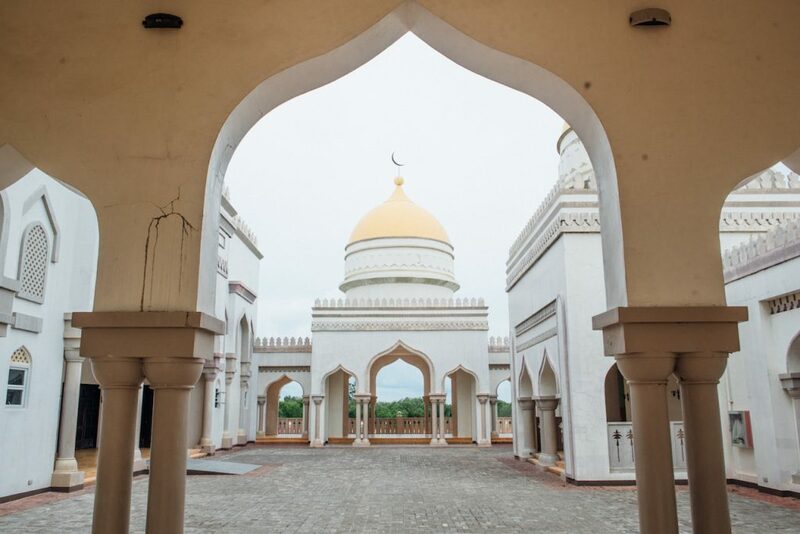 The Grand Mosque in Cotabato City is also known as Sultan Hassanal Bolkiah Grand Masjid. Nolisoli.ph visited the tourist attraction in August, and indeed, it was a sight to behold. Its simple but tasteful architecture, by Felino Palafox Jr., radiates elegance, letting in all the sunlight it can. It has a rotunda with a water fountain in the middle and four towering minarets standing 40 meters high. Its grandiosity was overwhelming. It was funded by the Brunei government in 2008 to the tune of roughly P2.5 billion. However, while walking on the labyrinthine corridor and expansive sahn or courtyard that appeared dingy, I couldn’t disregard the building begging for a paint job, a ceiling that needs to be overhauled and not just patched with sealant, washrooms and ablution (ritual purification in Islam) area begging to be deep-cleaned. What used to be captivating gold-painted domes are now just pale yellow, peeling and cracking. 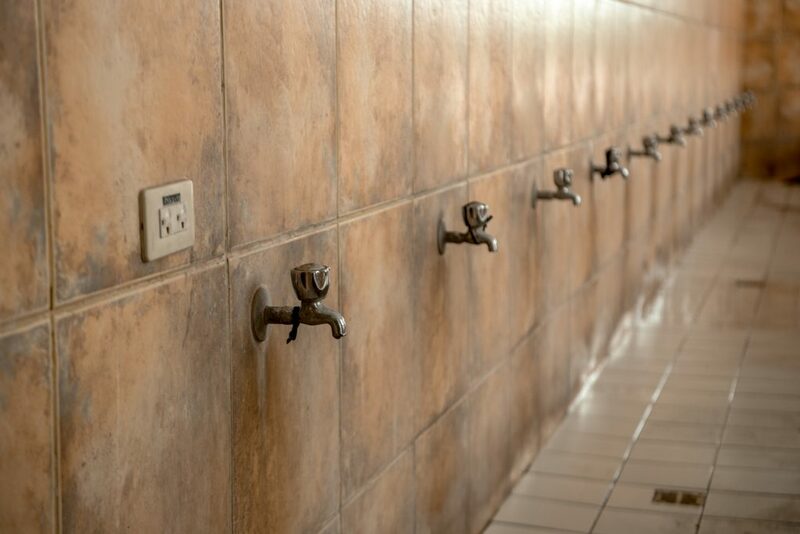 This is the ablution (ritual purification in Islam) area begging to be deep-cleaned. I don’t know if the Grand Mosque still makes its visitors’ mouths agape, but I am sure that it did when it was newly constructed six years ago. Almost eight kilometers away from the national highway, the Grand Mosque is a respite for Muslims and non-muslims alike. It’s near the idle banks of Tamontaka River, Moro Gulf, and Dilangalen fish pond, surrounded by the quiet countryside. Public utility vehicles aren’t allowed on the Tamontaka Bubong road, but visitors can ride tricycles to the mosque. 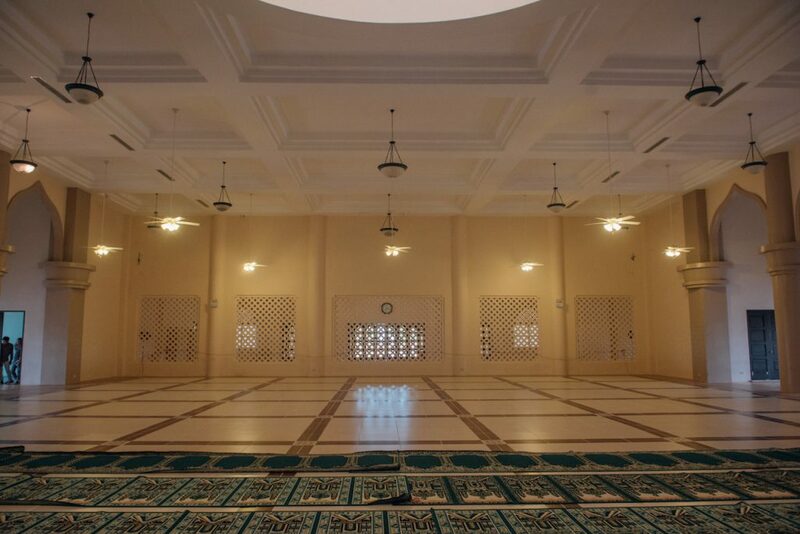 The halls can accommodate up to 2,500 men and women worshippers. 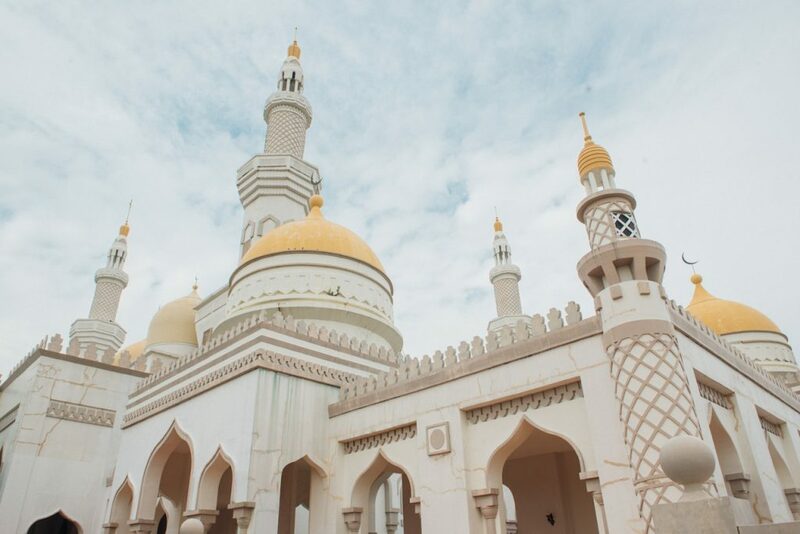 The mosque was funded by the Brunei government in 2008 (to the tune of roughly P2.5 billion) and named after the country’s incumbent sultan. The land it’s occupying is a donation from former Maguindanao congressman Didagen Dilangalen. 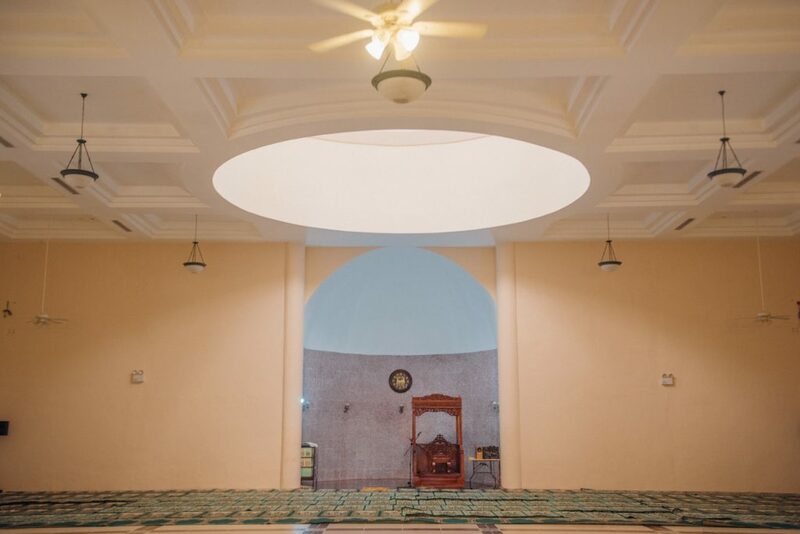 “At the back of the mosque, we are planning to build a grand function hall that can hold international activities,” Grand Mosque executive director Ustads Norulam Abdulla told Inquirer in 2012. It’s patterned after mosques in Brunei noted by their grandiose domes, minarets, and prayer halls. But when we paid the mosque a visit, we didn’t see a grand hall, just an unkempt landscape. It really looked like it has been forgotten. It currently depends on donation for maintenance until its turnover to the city government. “A few weeks from now, the contractors for the mosque will come over and re-paint the building. They will also finish constructing the yard,” says Saranggani while we were there. The contractors were difficult to contact, he said, as they are from Manila. While they haven’t repaired the mosque, Saranggani would have to put bandages to the mosque’s injuries. Ultimately, the two supervisors wish that the mosque would be turned over to the national government. This would allow the Cotabato City government to provide funds for the mosque’s maintenance and wages for the supervisors who should no longer be volunteers. And in this case, they won’t be needing donation boxes.